Kamptee, Nagpur . 04 August 2018. It was a proud moment for recruits, parents and instructors of recruits of the 117 Course as they attained the status of a combat soldier at an impressive and solemn passing out parade at The Brigade of The Guards Regimental Centre, Kamptee on 04 Aug 2018. A vibrant and immaculate Ceremonial Parade was presented by these proud young ‘GUARDSMEN’, who now set forth to serve the nation, ready and well trained for frontline duties. These motivated and spirited young guardsmen have earned their status after challenging and strenuous training of thirty four weeks. Keeping with the age old traditions, they were administered the oath of allegiance and devotion to duty by the Adjutant. Pride was writ large on their faces as they crossed the symbolic “Antim Pagh” in slow march to the lilting Auld Lang Syne tune of the military band. It was indeed a proud moment for the kith and kin of these recruits who had come from far flung areas to witness the eventful ceremony in which their wards participated. Medals were presented to outstanding Guardsmen in various disciplines of training. The coveted Overall Best Recruit Trophy was awarded to recruit Tinku Jangid of Chandra Gupt Training Company. 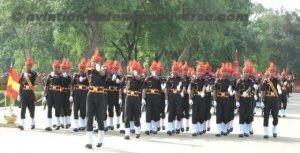 Major General Rajesh Kundra, Sena Medal, General Officer Commanding, Uttar Maharashtra & Gujrat Sub Area reviewed the parade. 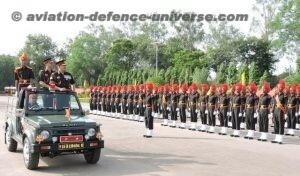 The Regimental Centre is equipped with state of the art training infrastructure and aids to ensure that the best quality training is imparted to the recruits by the selected instructors of the Regiment. The Regimental Centre grooms, nurtures and transforms young men into disciplined and well trained soldiers prepared to face today’s environmental challenges. The Regiment has been bestowed with 10 Battle Honours (Post Independence) and has a long list of gallantry awards which include two Param Vir Chakra (PVC), Two Ashok Chakra (AC), Six Mahavir Chakra (MVC), Four Kirti Chakra (KC), 40 Vir Chakra (VrC), 33 Saurya Chakra (SC) and 154 Sena Medal (SM), which is a testimony to the valour and sacrifice of the Guardsmen.